It’s the dynamic duo! 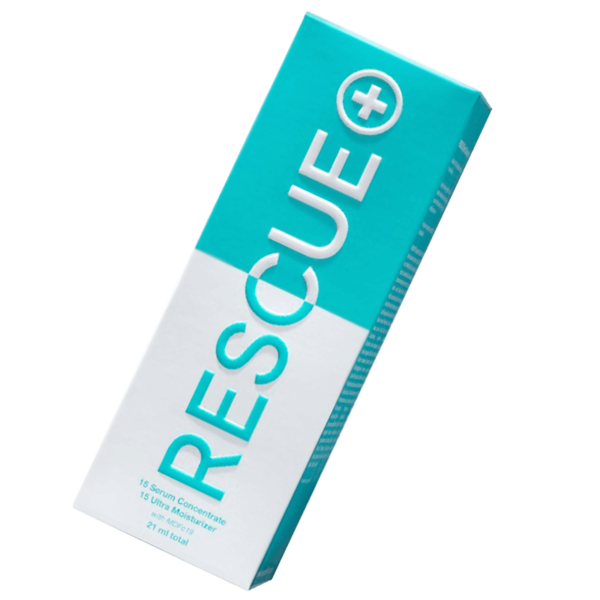 The RESCUE Skin 50/50 Combo encompasses their stellar Serum Concentrate and Ultra Moisturizer in single use packets. Each contains revolutionary stem cell derived actives that do wonders in making your skin look healthy and younger thanks to a bump in pro-collagen and dermal fibroblast production as well as an increase in cellular turnover. Why have both a serum and a moisturizer? The serum is made up of smaller molecules that can dive deeper into your skin layers, while a moisturizer normally works on the top layer of skin. But RESCUE Skin’s Ultra Moisturizer is special, in that it is made from stem cells that penetrate beyond the top layer of skin and stimulate the production of the cells that repair damage such as dark spots, reduced elasticity, and wrinkles. The handy individual packets make it easy to take on your travels but also ensure that the formula is most effective and hygienic, because you’re not dipping your fingers into a jar, exposing the contents to oxidation and introducing germs. Double down for fresh, youthful skin with the RESCUE Skin 50/50 Combo!